Opulence. A word that brings images of luxurious fabrics in red & gold. Velvet, embellishment and furs galore. Basically christmas right? There’s never a better time to wear opulence than fall/autumn/whatever you want to call it so with the party season almost within reach I’ve put together some of my top looks and pieces. Just scrolling through Farfetch Dolce & Gabbana stands out so much to me. Lace, embellishment and dripping in gothic gold jewellery it’s not rare to see a Dolce & Gabbana model sporting a crown. Opulence. The second and more surprising brand I’ve spotted rocking the opulence trend is Fendi. Now I’ve always thought of Fendi as a super fun and playful brand, don’t get me wrong some of their product 100% is. But having a scroll there are so many opulent pieces they’re really giving Dolce & Gabbana a run for their opulent money. I’m talking gold handbags and red velvet shoes with tons of embellishment and they’re not the only ones. If you’re not up for spending thousands on a lace dress or a silk embellished jacket from Dolce & Gabbana. The high street has some insane alternatives. To me, you’ll probably notice that over the time I’ve been blogging, as I’ve grown I’ve developed a love for luxury accessories. For me this means stocking up on great high street trend pieces and finishing the look off with a luxury piece to make the outfit pop from the likes of Farfetch, Net-a-Porter & Matches Fashion. 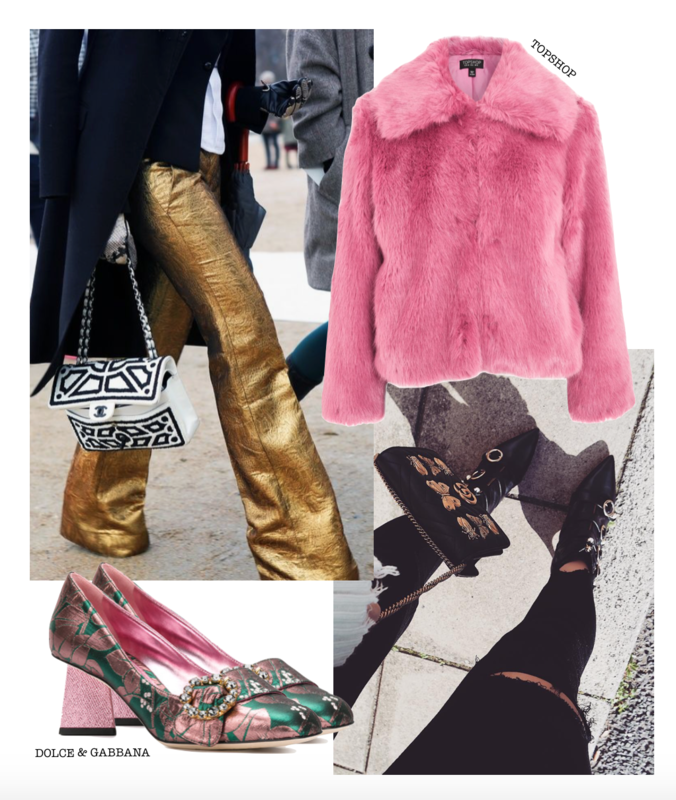 I’m thinking the Topshop pink faux fur coat with the insane Dolce & Gabbana gold chocolate box bag or this Asos cream number with those Fendi velvet heels and that Dolce & Gabbana box bag! What do you think? Do you love the opulence trend for autumn or is it something you wouldn’t invest in?! P.S – You can click on the little plus signs to shop my collages! Sometimes more is more and this is one of those times! Love this! Love this style edit! Velvet and glitter are always a fun combination and definitely scream luxury! One item on my wishlist is this cute gold sparkle phone case: http://www.32ndshop.com/apple-iphone-6-6s-plus-ultra-slim-hard-shell-glitter-case/. Would make for the perfect bling accessory to one of these outfits!